Ronda Rousey, a mixed martial artist, has recently gained increased popularity after knocking out Bethe Correia in 34 seconds, defending her Bantamweight Title at UFC 190. With her increased popularity, Rouse has decided to release her “No D.N.Bs” t-shirt line, donating a portion of the proceeds to Didi Hirsch Mental Health Services. Didi Hirsch Mental Health Services specializes in mental health areas including suicide prevention and body image. Rousey, whose father committed suicide after learning he would be a paraplegic due to a severe back injury, hopes to also bring attention to women with body issues with the “No D.N.Bs” t-shirt line. Rousey explains the concept behind No D.N.Bs on the t-shirt website: "I have this one term for the kind of woman my mother raised me to not be, and I call it a do nothing b*tch. A DNB. The kind of chick that just tries to be pretty and be taken care of by someone else. That’s why I think it’s hilarious if my body looks masculine or something like that. Listen, just because my body was developed for a purpose other than f*cking millionaires doesn’t mean it’s masculine. I think it’s femininely badass as f*ck because there’s not a single muscle on my body that isn’t for a purpose, because I’m not a do nothing b*tch. The t-shirt line features a black and white image of Rousey wearing a sports bra in a meditative and empowering pose, showing her athletic physique, on the edge of a bed. As of Wednesday, August 12, 2015 32,232 have been sold; the goal was 1,000. The “No D.N.Bs” t-shirts, along with tank tops, sweatshirts, hoodies, and unisex apparel will be available until August 20, 2015. 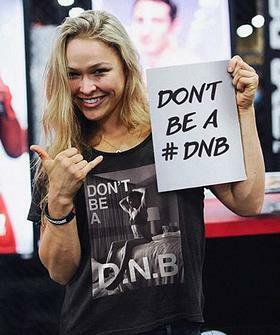 To purchase Rousey’s “No D.N.Bs” please visit represent.com/ronda. To learn more about Didi Hirsch Mental Health Services, visit didihirsch.org.